With the Department of International Trade (DIT) expected to announce grant availability at the end of November, there is still opportunity to participate in Chinaplas 2019, taking part next May. 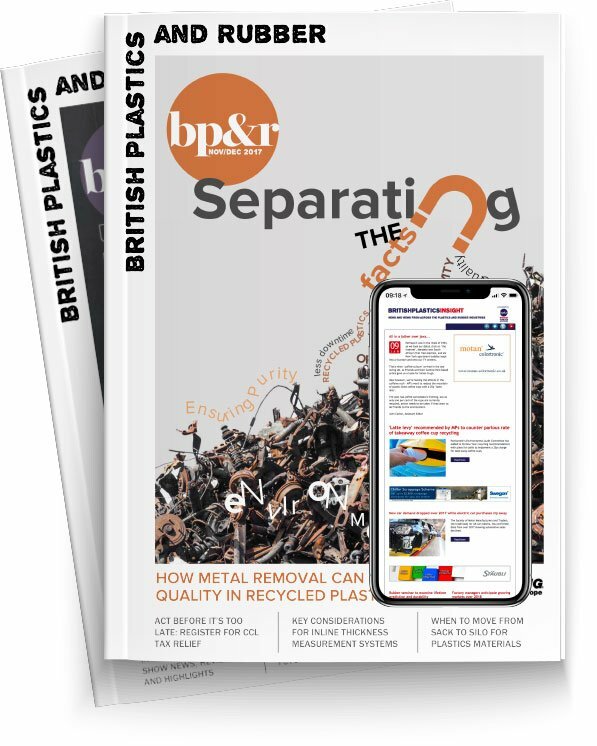 Here, Justyna Elliott of the BPF writes exclusively for BP&R on the opportunities China holds for UK plastics businesses. Now spanning 25 halls, the annual Chinese plastics exhibition has become the largest tradeshow in the world in terms of exhibitor numbers. Over the past decade, exhibitor numbers have doubled and visitor numbers have grown from 72,000 in 2008, to over 180,000 in 2018. China has over 160 cities with a population above one million,an overall population of over 1.38 billion and a well-documented, fast-growing consumer market. DIT reports that the United Kingdom is the second largest European investor in China, with Jaguar Land Rover (JLR) being the largest UK exporter to the country. It is well known as an attractive destination for many British exporters, including those from the plastics industry, and data suggests that markets are continuing to grow. China imported $1.841 trillion worth of goods from around the world in 2017. Out of these, the product groups that represent the highest value according to World’s Top Exports (WTEx) are electrical machinery and equipment $455.5 billion (nearly 25 per cent of the total); and mineral fuels –including oil – at $247.6 billion (13.4 per cent). Plastics and plastic articles are seventh out of the top ten product categories imported to China, totaling $68.9 billon. China is a major destination for the export of plastic raw material. In 2017, China imported over 28 million tonnes of material, far more than it exported, at just over eight million tonnes, according to EUROMAP data. Overall consumption of raw material in 2016 was nearly 84 million tonnes. Average plastics consumption in China per person per capita is not far from the average European. In 2017, it came to just over 60kg per person whereas Europe’s consumption per person was nearly 70kg per capita, according to EUROMAP. Sectors with the largest share of plastics material usage are: packaging with 42 per cent, construction with 22 per cent, followed by automotive, electronics / electrical and other sectors, which jointly come to around 20 per cent, EUROMAP reports. Raw material consumption by processing method shows the largest one being extrusion at nearly 50 per cent, then injection moulding 31 per cent, followed by blow moulding, PET preform and stretch blow moulding stated by the above report. China’s cheap labour and the competitive advantage of its infrastructure will not be sufficient in the long run to drive sustainable growth. In May 2015, China’s State Council announced a national strategy called Made in China (MIC 2025), which is led by the Ministry of Industry and Information Technology (MIIT). The initiative involves turning China into a global manufacturing power, with emphasis on innovation and sustainable manufacturing. MIC 2025 has set objectives up to 2025 and further long-term ones up to 2049. The MIC 2025 plan details nine strategic tasks: to encourage innovation; to promote the use of integrated, digital, technology-focused manufacturing; to restructure industries to improve efficiency and output; to focus on enforcing green manufacturing methods; to strengthen the overall industrial base; to improve product quality and build global Chinese brand names; to make innovative technological breakthroughs in the ten priority sectors; to improve service-oriented manufacturing and manufacturing-service industries; and to globalise Chinese manufacturing industries. With the scope of MIC 2025 including high-end manufacturing and smart manufacturing, there are gaps for British exporters that supply solutions to improve efficiencies in energy, labour and materials. China needs suppliers of high-end equipment, robotics and automation, and 3D printing technologies — but also supporting services and training. EUROMAP world market data somewhat reflects this, showing sales of European machinery to China increased by 20 per cent between 2016 and 2017, and are now worth over €1bn. China needs suppliers of high-end equipment, robotics and automation, and 3D printing technologies — but also supporting services and training. China is not one single market. Due to its size and character, the country varies and has several regional economic hubs. UK companies are advised to research the market to maximise the opportunities presented by this unique economy. DIT advises a mixture of desk research and market visits. A business culture aspect, which is important to remember, is a degree of personal interaction with a Chinese partner. A market visit helps to build trust and show commitment to a prospective or current business partner. Another thing to consider when considering selling to China is finding a local agent or distributer who is familiar with the local market. It may be that a company has a couple of representatives in different regions, as the market is vast and diverse. One way to find or verify a local contact is to visit the market in person. The British Plastics Federation (BPF) has been taking groups of British plastics companies to China for over two decades. It organises the British Pavilion at Chinaplas, which will be taking place 21-24 of May 2019 in Guangzhou. The event has international appeal, with over 40,000 visitors last time originating from outside China. There are thirteen international pavilions: Austria, Canada, France, Germany, Iran, Italy, Japan, South Korea, Switzerland, Taiwan, Turkey, the UK and the USA. DIT is expected to announce grant availability at the end of November. If you wish to book a stand or register interest, please click here. The deadline for booking is 19 December 2018. Sources: Department for International Trade (DIT), Made in China 2025 report, EUROMAP market data, World’s Top Exports (WTEx).